Just as power tools have been replacing manual tools in the field of DIY, so they are starting to replace manual tools in the kitchen. In particular, electric knives and electric slicers, both of which were once seen as gimmicky gadgets, are now being seen as genuine conveniences, which benefit even people who have full use of their hands and which can be invaluable to anyone dealing with mobility issues, such as rheumatism or arthritis, or anyone who has a hand injury. Why have electric carving knives and electric slicers become so popular? There are three main reasons why electric knives and electric slicers are steadily growing in popularity and these are safety, consistency and economy. At the risk of stating the obvious, knives are sharp and so you really need to pay attention to how to handle them. This can become a real problem when preparing tough food as users have to balance the need to use physical strength with the need to maintain good (i.e. safe) technique. This is possibly the single biggest reason why electric carving knives have become so popular. They eliminate the need to use manual force and therefore leave the user free to concentrate on using the knife properly. One of the most fundamental concepts of cooking is that food items which are similar in size and consistency will cook at about the same rate. This is one of the main reasons professional cooks invest so much time and energy into learning how to cut up food properly. Most amateur cooks can do a decent job of cutting softer foodstuffs but may struggle with tougher foods, hence an electric carving knife, (which can do far more than just carve) can be a great tool for ensuring consistency without frustration. Not only do electric knives help to reduce food waste, but they are also very economically priced as compared to manual knives of a comparable performance standard. Admittedly, they do draw on electricity, however, their consumption is minimal. Electric carving knives are much more compact than electric slicers and they are also more flexible in how they can be used, for example if you wanted you could use them to cut shapes other than flat slices. Electric slicers only do one job, i.e. cut flat slices, but they do it very efficiently. Electric slicers are much quicker than slicing meat, bread and cheese by hand and work out much more economical than buying sliced meat, bread and cheese. In other words, if you have the space and budget it can be very worthwhile to have both. Here are some of the key points to look at when comparing electric carving knives and electric slicers. Does it work off the mains, batteries or both? If you’re planning on using your electric carving knife or electric slicer in much the same place then you may be perfectly happy to have one which is fully corded. If you want a bit more flexibility then you may want the option to use batteries, however, since these will only last for so long before needing charging (or replacing), you may still find it handy to have the option to use your electric carving knife or electric slicer on mains power as a backup. How long is the cord/battery life? Having a long cord gives more flexibility but it also gives you a longer cord to manage. Similarly longer battery life gives longer periods between charges (or replacement batteries) but the trade-off for this is that the batteries become bigger, heavier and more expensive. Most cordless electric carving knives and electric slicers use standard AA batteries but you might want to double-check this so that you have a clear idea where you stand with regard to charging, chargers and replacements. What material is used for the blade? In terms of quality, stainless steel is the clear winner (at least out of the materials available at the moment). 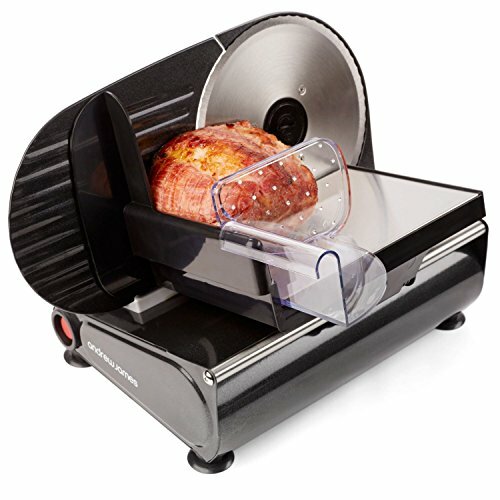 Lower-priced electric carving knives and electric slicers will tend to have blades made out of other materials, such as composites, which might appear to work well in the short term, but over the long term they will generally be more susceptible to becoming dull, rusting and tarnishing. Does it have different blades for different foods? High-quality electric slicers often provide different blades for different types of foods. Electric carving knives are (currently) less likely to do so, but the good ones will still perform well on a range of foods. If you’re going to be holding something for a long time, then a comfortable handle is a must. In addition to having ergonomic contours, you ideally want the handle of your electric carving knife or electric slicer to be designed in such a way that any buttons are easy to reach. This also promotes safety as it makes it easier to control the electric carving knife or electric with just one hand. Usually electric carving knives and electric slicers have blades which are dishwasher-safe. In some cases you may be able to put the handle in as well. What safety mechanisms does it offer? If you’re buying an electric carving knife or electric slicer from a mainstream UK (or international) retailer, then you can generally take it as read that it will be safe to have in a home and will have some form of measure in place to stop it being accidentally turned on (e.g. by children). If you choose to buy from a more niche retailer, then it’s really important to check this. What warranty is offered (and how reliable is it)? Not to put too fine a point on the matter, but mainstream retailers tend to stick to well-known brands which can be counted on to provide reliable products and to stand by their warranties on the rare occasions when there is a problem. If you choose to buy from a more niche retailer or an unknown brand then be aware that your warranty may be meaningless. What is the best electric carving knife on the UK market? Even though electric carving knives are growing in popularity there still seem to be surprisingly few of them and even fewer which we would be happy to recommend, however, after extensive research we have managed to find four electric carving knives on the UK market today which, we feel, offer a good balance of performance, reliability and overall value. The Judge JEA76 is marketed as an electric knife rather than an electric carving knife and we’re not sure why because really this knife is only suitable for carving cooked meat. It has a 150 Watt motor and a decent blade which appears to be made of stainless steel although we can’t see that marked anywhere. We can tell you that it comes out easily and is dishwasher-safe. The handle is comfortable to hold and the buttons are strategically placed. This electric carving knife works off a cord, which might not be immediately clear from marketing photos. While the Judge certainly isn’t perfect and we’re not entirely convinced that it’s going to last much beyond its warranty period, it is affordable and very simple and comfortable to use as well as reasonably quiet. We therefore thought it might be a good option for an older person for whom simplicity in use (and cleaning) was the main consideration. 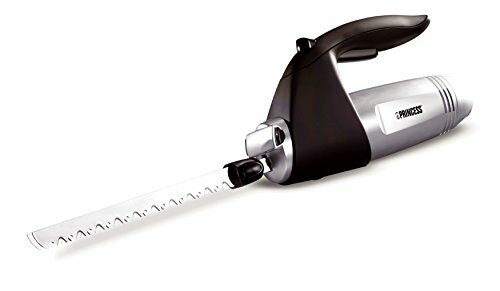 We actually think the Princess 2952 looks more like a miniature chainsaw than an electric carving knife, this may be a factor in its robust cutting performance, although we suspect that the 180 Watt motor probably has more to do with it. It may be a bit more complicated to use than the other electric carving knives on our list and it’s certainly at the premium end of the price range, but these are both good indicators of the overall quality of this electric carving knife. For the sake of avoiding confusion, we’d like to point out that although the cord can be removed for storage, this electric carving knife is purely mains-operated. We’d have prefered the cord to have been a bit longer but we understand why manufacturers often prefer to keep cords shorter so that they are less of a potential kitchen hazard. In all honesty, right-handed users might struggle to justify the higher price point of the Princess 2952, but left-handed users might find the handle the most comfortable to use out of all the electric carving knives on our list. The Russell Hobbs 13892 electric carving knife offers 120 Watts of cutting power over a 203mm stainless-steel, serrated blade. It has a comfortable handle with thumb-tip control button and integrated cord storage. We’d have preferred the cord to have been a bit longer, but again manufacturers are often very aware of health and safety. This electric carving knife is very easy on the ear, certainly not silent, but very quiet compared to others on the market. 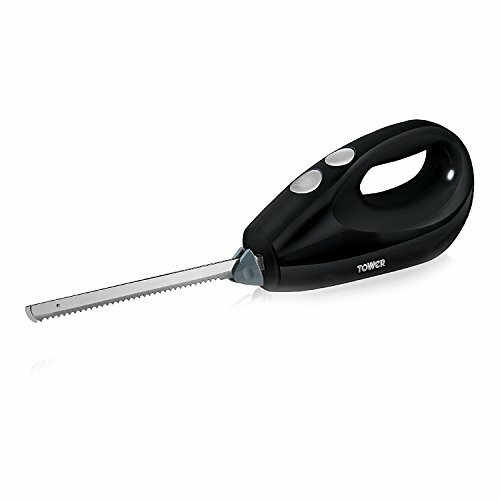 The Tower T19003 electric carving knife has 180 Watts of power and a 175mm stainless-steel, serrated, twin blades, which are dishwasher-safe. There is an ergonomic handle with easily-operable buttons and the cord is of a reasonable length. It has to be said that this electric carving knife is rather over-promoted, for example, it’s said that it will cut through frozen foods, which, as far as we can tell, is simply not the case, in fact it’s not even great for cutting really crusty bread, which is why some customers are very disappointed with it. If however you look past that then the Tower T19003 electric carving knife could actually a perfectly decent option for people who just want an electric carving knife to use for exactly that purpose, i.e. cutting cooked (soft) meat and perhaps soft bread (with minimal crust). It’s compact, budget-friendly and quiet and there is minimal vibration in operation. Objectively speaking, the Princess 2952 electric carving knife offers the best performance, but it also carries the highest price and this may be hard to justify unless you are left-handed. The Russell Hobbs 13892 electric carving knife offers very good performance and is much more affordable and hence may be considered the best overall. The Judge JEA76 and the Tower T19003 electric carving knives both have their limitations but they may still be the best choice for certain users, especially those who value simplicity. What is the best electric slicer on the UK market? We were actually quite surprised to find how many good electric slicers there were on the UK market and it was more difficult than we’d expected to whittle down the options to just five, however, we’ve managed to do so and here is our list of recommendations, again based on performance, reliability and overall value. 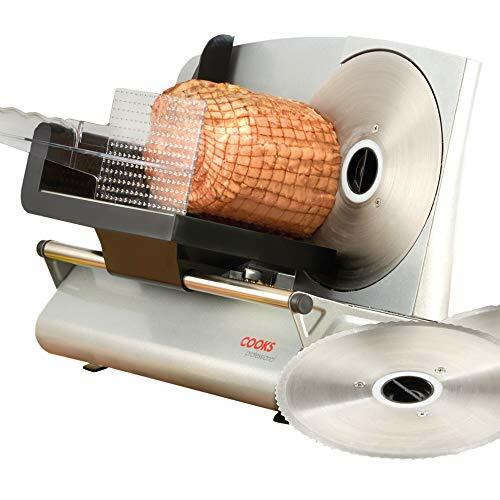 The Albones electric slicer has a 150 Watt motor and comes with three, stainless-steel blades (undulated, non-serrated and serrated) of about 19cm in diameter. These can easily cut meat, bread or cheese into slices from 1mm up to 1.5cm thick. This electric slicer can even deal capably with frozen food. There are four rubber feet to keep this electric slicer nice and stable and a blade guard to protect your fingers. The blade rotates anti-clockwise so there’s no danger of juice going over the switch and you can choose between constant or intermittant work. The Andrew James electric slicer has basically been designed to be a somewhat smaller version of the electric slicers you see in food shops. It has a 150 Watt motor (which runs more quietly than we would have expected) and three, stainless-steel blades of 19cm in diameter, one for bread, one for meat and cheese and one “universal”. Slicing thickness is between 1mm and 1.5cm. There are stabilizing feet and a blade guard with “spikes” to help keep your food in place. 2-YEAR WARRANTY -- Shop in confidence. 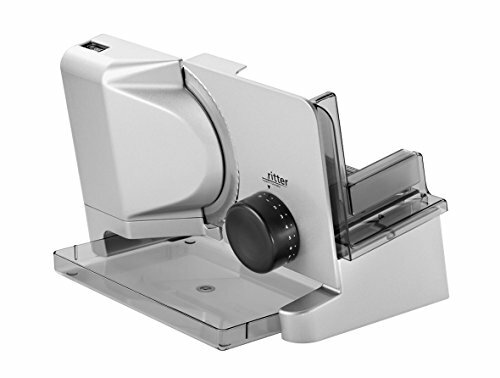 Your Andrew James Electric Food Slicer is covered by a 2-year manufacturer's warranty. The Cooks electric slicer has a 150 Watt motor and three stainless-steel blades (straight, serrated and wave) of 19 cm in diameter. It can produce slices of between 1mm and 1.5cm in thickness and offers a choice of constant or intermittant work. There are suction feet for good grip and the electric slicer comes with an end-piece holder for extra safety. 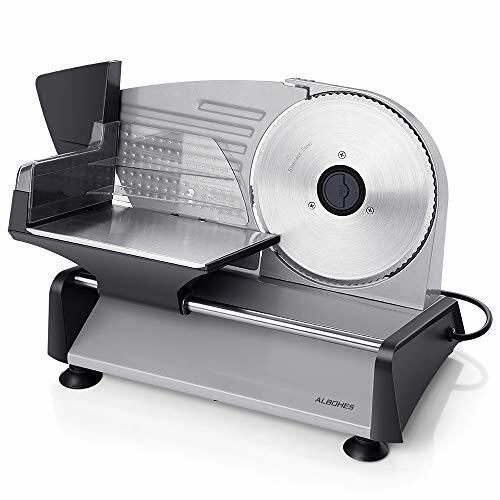 This electric slicer is one of the more affordable options and so is best kept for food which is compact and slighly moist such as fresh meat, cheese and softer bread, rather than frozen or dry food. 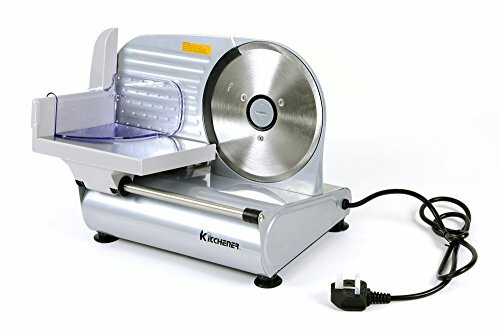 We’ve seen the Kitchener electric slicer also advertised as a sausage stuffer but as far as we’re concerned it’s a perfectly capable electric slicer with a 150 Watt motor and a single stainless-steel blade (of 19cm in diameter) which cuts between 1mm and 1.5cm in thickness. This is intended for slicing meat and you can buy additional blades for bread and for “universal” use. It also uses suction feet for grip and has a food pusher with “teeth” for even better control (and finger protection). The Kitchener really does look and feel like a premium model and copes very well with both fresh and cooked food including fruit and vegetables, (its manufacturers guidance is to avoid using it for frozen food). Out of all the electric slicers on our list, this was one of the easiest to take apart for cleaning and to put back together again. The ritter electric slicer is the most premium option on our list, but really does put in an excellent performance. It’s driven by a 65 Watt “eco motor”. We have absolutely no idea what makes it an eco motor, but we can tell you that it performs at least as well as the 150 Watt motors in the other electric slicers on our list and is exceptionally quiet. This electric slicer comes with only one blade which is serrated and 17 cm in diameter, but again it works well on all kinds of food and can produce slices of between 1mm and 2cm in thickness. You can choose between continuous and intermittent operation and there is a food holder with spikes for extra grip (and safety). Grip is further improved by the rubber feet in the base. As a final point, we really liked the detachable carriage and food tray. They are both conveniences rather than essentials, but they are also genuinely handy. Objectively speaking, the ritter offers the best performance out of all the electric slicers, followed by the Kitchener, but both of these are priced at a premium (especially the ritter) and may be more than you need. The Cook electric slicer isn’t intended for heavy-duty work but if you mainly want an electric slicer for meat, cheese and soft bread, then it could be a good, budget-friendly option. The Albohes and the Andrew James electric slicers are very similar and your choice between them will probably depend on your taste plus price and availability.